Yes, it's another spent grain recipe. When ya got 'em, ya gotta use 'em, right? 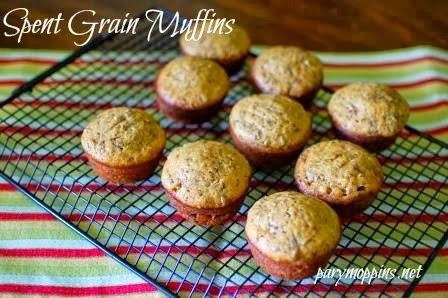 These muffins were hearty, had tons of texture, and I really liked the flavor; they weren't too sweet. Like the granola, I didn't dry these grains first; I just drained them. If you find yourself with two tons of spent grains, give these a try. In a glass bowl, soak the grains in the buttermilk overnight on the counter. Put a tea towel over the top of the bowl. The next morning, preheat the oven to 400F. Spray muffin pan with non-stick spray or use cupcake liners. This is part of Full Plate Thursday, SITS, & See Ya in the Gumbo. They were pretty good if I do say so myself Ms. BJ. :) Thanks for stopping by! I on the other hand, have been using tons of whole grains but have never tried spelt. It will have to be next on my list. :) Thanks for stopping by! These Muffins look great Pary, wish I had one. Thank you so much for sharing with Full Plate Thursday, and have a great weekend. So...have you used all the grain yet? If not, I can't wait to see what you come up with next. These muffins sound like a perfect filling and hearty breakfast. Thanks for sharing!